Title translates to Carl Moershel's kitchen garden. Family members sitting on homes front porch, post communal era. 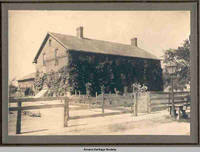 Identified as the farm manager's home on a different photograph. This building also served as a church building.